Katie Daniels is a poet. Her first poetry collection, Catch (Redbeck Press) was published in 2007. Other poems have appeared in various publications including Iota, Magma, Other Poetry, Obsessed with Pipework and Nthposition. In 2008, Katie was awarded Arts Council funding to complete a poem sequence called ‘The Geometry of Distance’. She also participated in an Inky Fish poets' reading tour funded by the Arts Council (2006-2007) where she read alongside poets such as Catherine Byron, Pam Thompson, Robert Hamberger and Mark Goodwin. 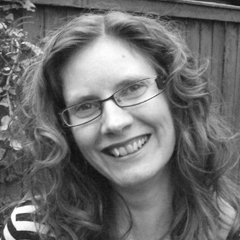 Katie grew up in East Anglia, moving to Leicestershire in 1990 to study Arts Management, and subsequently working in local government for ten years before founding her own business. She now works as a freelance arts development consultant and writer. She lives in rural Leicestershire. visible husks not yet ripe or turning gold. how the green wheat pulls at my ankles while running. I wrote this poem after a workshop led by Mark Goodwin at Ullesthorpe Windmill, near Lutterworth. The mill was built in 1800, and remains largely unmodified. Mark’s workshop was part of the ‘Behind the Scenes’ series operated by Leicestershire County Council for many years, offering poetry workshops at heritage sites at times when they were normally closed to the public (sadly, the scheme has been a casualty of recent funding cuts). ‘Behind the Scenes’ has been hugely important to me as a writer. I also cut my teeth as a workshop leader under this scheme. My first poetry workshop took place at the Barrow-Upon-Soar Collections Resource Centre, and since then I’ve continued to lead workshops in a range of settings. This poem rewinds from flour to a field of wheat, the bracketed words prompting the reader to move backwards through time. The poem reflects both my experiences of exploring the mill at Ullesthorpe and my childhood in Suffolk. I grew up in a rural area and my secondary school backed on to a country park where my friends and I would wander at lunchtimes. Territorial battles would sometimes take place here, with lads from our class trying to chase us away; this is reflected in the last stanza, which echoes memories of running through waist-high wheat. I’d wanted to write about it for some time, but it was Ullesthorpe Windmill that finally coaxed the words out of me. My mum has owned her magnificent flour tin since she got married in 1961. It has huge vintage appeal so, when Mark Goodwin asked us to think about ‘flour’ at his workshop, my mum’s flour tin was what I saw. Quite a lot of this poem is quietly about my mum - who makes fantastic bread rolls.